Time for a big review for a big game. Super Mario Odyssey launched just under a month ago, and I have 100% completed it. My review shares my thoughts on the game, and despite loving it, I do have some gripes with aspects of Odyssey. I have tried to remain as spoiler free as possible in my review, but let me know if anything jumps out and surprises. Two of my favorite video game franchises have received big, blockbuster entries this year, and both are on the Nintendo Switch. I already was blown away by the breadth of the content, world, and freedom seen in The Legend of Zelda: Breath of the Wild, and now I turn to my number one genre of adoration, the platformer, with Super Mario Odyssey. A 3D Mario game, much like a new 3D Zelda, is a gaming event. It doesn't happen often, but usually when it does, there is something quite magical in the air and unadulterated joy to be discovered. That's how it was for me on the Nintendo 64's launch day, running in circles and jumping like a madman in Super Mario 64, in my final year of elementary school. In my early high school years, cleaning up the mess left behind by Shadow Mario in the GameCube's Super Mario Sunshine was also a positive gaming memory for me that sucked hours away from my summer vacation. Then, the magic from my early 3D Mario days returned, but this time in handheld form with Super Mario 64 DS. That N64 game that I fell in love with -- the one where I ogled my Nintendo Power strategy guide to find what "Rainbow Across the Skies" meant, the one where I wondered where the heck that blasted eighth red coin in Whomp's Fortress was, and the game which was one of the earliest video games that I owned the soundtrack for (albeit in tape cassette form) -- was now playable in my hands. What was once a game confined to a television screen could now be played in a device that could be folded up and could fit in my pocket! Following that were two of my favorite gaming experiences of all time, the one-two knockout punch of the Super Mario Galaxy games. The first was a revolution, offering gravity-centric platforming beyond the limits of earth and moving to small, spherical planetoids and amazing orbiting obstacle courses. The second game served a bit like an expansion kit, adding a stiffer challenge while throwing in platforming concepts and ideas that the original Galaxy just couldn't fit. It was an excess of excellence! Super Mario 3D Land and Super Mario 3D World followed, dialing back the scope of 3D Mario, and bringing it back to a feel of a 2D obstacle course with linear levels but played out in a 3D atmosphere, with World showcasing a greater variety and more complex designs. These four games (the Galaxy titles, 3D Land, and 3D World) took Mario away from the established structures of 64 and Sunshine. While those games introduced then-unimaginably big and complex sandbox, platforming playgrounds to explore and just let the player run loose in, Galaxy 1/2 and the 3D Land/World games were obstacle courses where getting from the beginning of the level to the goal was the primary objective. With a brand-new console on the market, Nintendo has been taking different approaches to its main entries, a somewhat fresh take, if you will. I started out by talking about The Legend of Zelda: Breath of the Wild, and that's a series that has had an established structure for years. By updating and changing series conventions, a profound Zelda experience was made, loved by fans and critics alike. 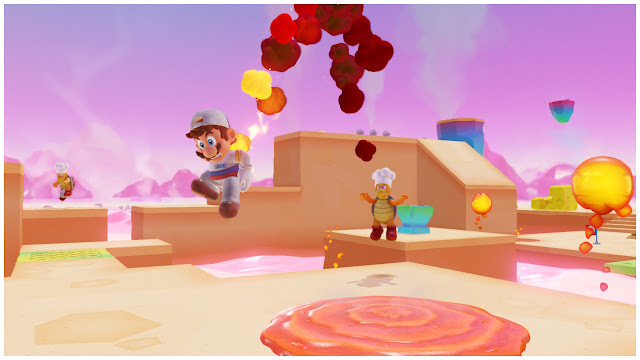 With Mario, his 3D games have continually added new bells and whistles as well as the occasional shakeup to the formula and structure to his starring roles. This is no different with Super Mario Odyssey. While not being as large of a revolution as Breath of the Wild was for The Legend of Zelda series, the game offers a new and worthwhile approach to 3D Mario games. Mario and Cappy: On the road to Bowser! Super Mario Odyssey begins in medias res as Mario confronts Bowser on the Koopa King's own custom-built airship. Once again, Princess Peach has managed to find herself kidnapped yet again. (Start giving those Toads some steroid-laced Mushrooms or something, Peach, so they can start protecting you!) Bowser reveals his master plan, wishing to marry the princess against her will, and immediately sends Mario flying off the airship and down into the clouds. 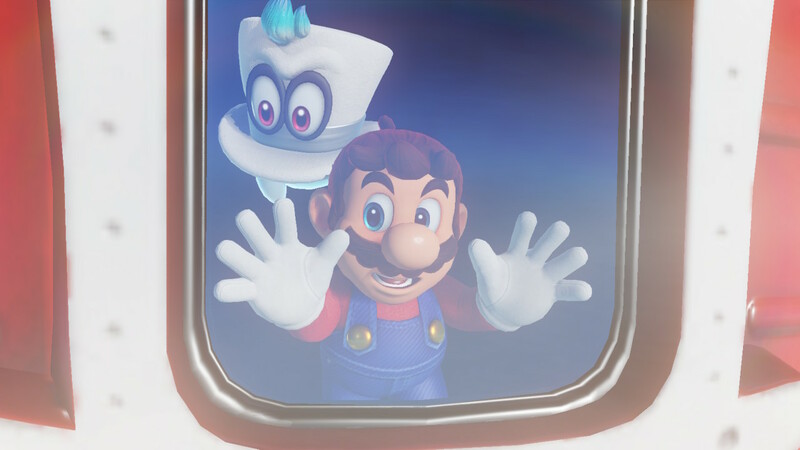 When he awakes, Mario finds himself with a new friend, a ghostly spirit wearing a top hat named Cappy. It turns out Bowser has taken from Cappy someone special as well. Mario and his new, stylish friend decide to work together to take down Bowser's nefarious scheme and put an end to this ill-conceived wedding for good. Cappy is headgear for the discerning hero. Cappy isn't just a fashion piece, however. There's form and function to this delightful piece of headgear. 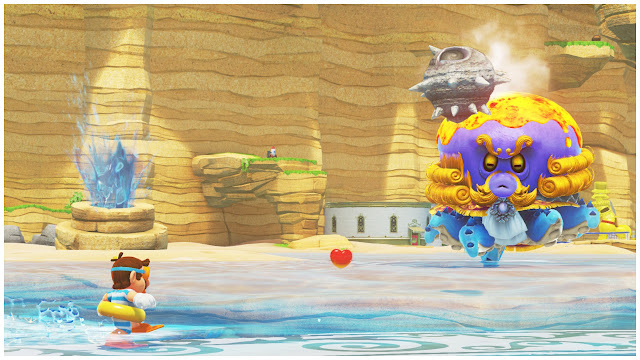 Mario can throw Cappy forward to not just take out enemies, but most can even be captured. I'm not talking like Ash Ketchum in Pokemon, where a Goomba winds up inside of a little ball so Mario can work his way to be the overall Goomba Master. No, I mean literally capturing and possessing them. To use the Goomba example, when Cappy is thrown at such an enemy, Mario's spirit will enter into it, becoming that Goomba -- though not without his trademark red hat and mustache, of course. 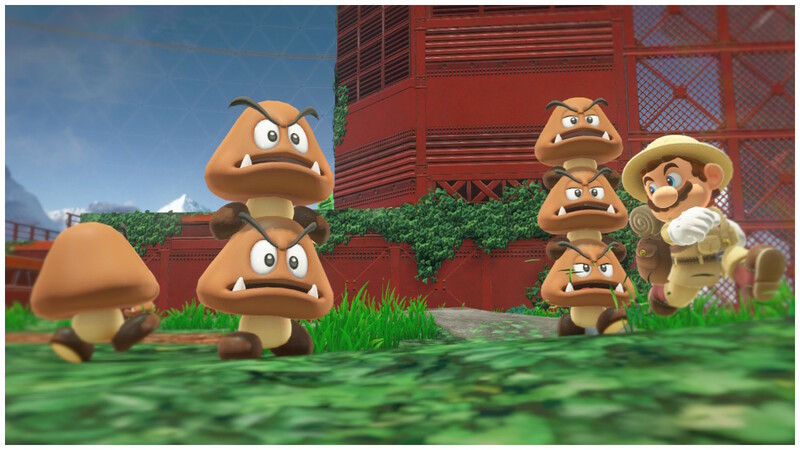 Goombas can then pile on to one another, creating towers of Goombas to reach high places. Ever wished for a chance to be a Paragoomba? (Of course you have.) Your dream's come true! 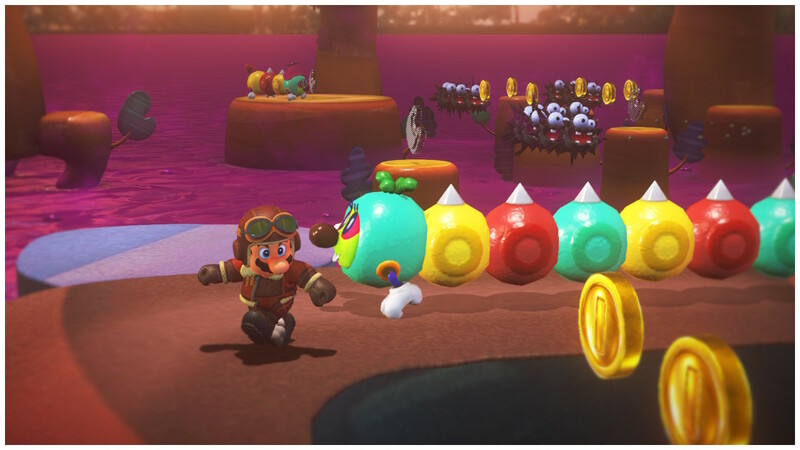 A lot of enemies and even objects within Super Mario Odyssey are able to be captured. A corralled Chain Chomp can be captured, pulled back against the force of its chain, and then launched forward to break through walls and in to other enemies. 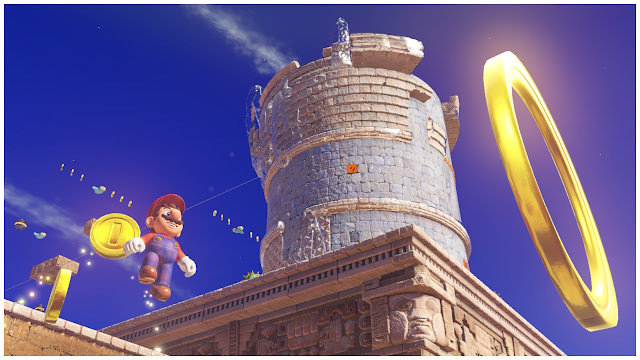 An electrical wire can have Cappy thrown at it, instantly turning Mario into an electrified Amp, charging and coasting along the wire to speed up skyscrapers or make shortcuts from the bottom of a mountain to the top. Even poles can be used, sort of like a platforming hat rack, allowing Mario and Cappy the ability to launch off them across great expanses. What you're able to capture as Cappy and control as Mario throughout Odyssey's length left me continually surprised. Whether it was a high-hopping frog, a lava-exploring ball of fire, or poison muck-spewing creature akin to what you'd see in Little Shop of Horrors, creatures that had long been haunts in past Mario games were now playable to me and used in truly creative ways. This was mind-blowing to me. That purple stuff isn't grape juice, Mario, so stay away from it. Nevertheless, the added benefit of having Cappy around isn't limited to his capture ability. No, a bonus ability is just how expansive the little cap makes Mario's arsenal, adding to the already vast lineup of platforming tricks the plump plumber could do in previous 3D mainline Mario games. You can use Mario to launch Cappy forward, hold the Y button to keep him there, and then vault off Cappy to perform a high jump. This can even be used with enough practice to cross huge gaps like throwing Cappy, jumping or even "long jumping" (a 3D Mario staple) on top of him, throwing the cap again, bouncing off him, and then performing a dive to cover the most ground. (And hopefully not smacking Mario's face into a wall over a bottomless pit.) The possibilities and combinations to chain Mario's moves is at an all-time high, and this goes well with completing certain challenges or merely doing them faster. Cappy introduces plenty of new possibilities into Mario's repertoire of moves. However, with all of these possibilities and chaining combinations to advance your ability to navigate the various lands of Super Mario Odyssey, there is an issue. A small numbers of moves and even captured enemy abilities are locked behind motion control movement, or at the very least, they're performed more easily with motion controls activated. Hence, the game's obnoxious need to show you an unskippable recommendation to use the Joycon controllers split apart while playing every time you boot up the game. There aren't many moves locked to motion controls, but the ones that are can make for a harder, more frustrating time for players who opt out of using them. 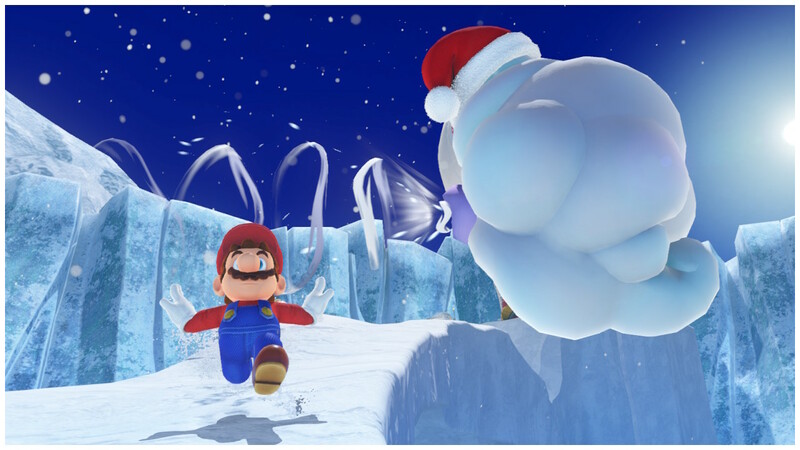 For example, rolling is a new technique in Super Mario Odyssey that is performed by holding down the crouch button after a long jump or while going down a hill. To get the most speed from a roll, you need to shake the Joycon controller. For one post-game challenge in Odyssey, it's almost impossible to do otherwise. (Keyword being "almost".) Things like swinging Cappy upward or downward to attack as well as home-in on enemies are completely impossible to do without motion control gestures, and capture abilities like leaping higher in the air than a normal leap with the frog or blazing a trail faster in the air as a Bullet Bill are only possible with motion controls, too. Disappointing. This enemy? Well, this thing's just a blowhard. The worlds in Super Mario Odyssey are known as kingdoms, and Mario and Cappy's ship, the Odyssey, grants you the ability to choose your next kingdom location to travel to. Of course, you need to acquire a specific amount of Power Moons (the equivalent of Power Stars in Super Mario 64 and Shine Sprites in Super Mario Sunshine) to charge up the vessel sufficiently enough to be able to travel to a new kingdom. The main story-related objectives in each kingdom are spelled out to you in full cinematic glory. Some kingdoms have one main challenge to do while others have multiple main challenges. Usually it's something like "reach this destination" or "beat this boss". The completed story objectives earn you one Power Moon while the kingdom's ultimate story objective grants you a Grand Moon (three Power Moons attached to one another similar in appearance to a banana bunch). Unlike past 3D Mario games of this type, once you and Mario collect a Power Moon, you're not booted outside of the level. You just continue as you were Banjo-Kazooie style! However, just getting the Power Moons from the story won't be enough to continue pursuing Mario and Cappy's hunt for Bowser and his captive Princess Peach. Many kingdoms feature some truly cool boss battles that put Mario and Cappy's skills to good use. Thus, you need to find Power Moons, and that shouldn't be very difficult as they are everywhere in Super Mario Odyssey. Well, not literally "everywhere", but it sure seems like you come across them from doing a whole slew of simple as well as complex tasks relatively easily. In most kingdoms, practically every turn is crawling with Moon opportunities. "Oh, here's a mysteriously glowing spot on this hill! Better ground pound it! ", "Oh, here's a button in the shape of a Goomba with the number six on it! Better become a Goomba and leap on four others! ", "Oh, this is an interesting-looking pipe that I've never seen before. Better go in it!" 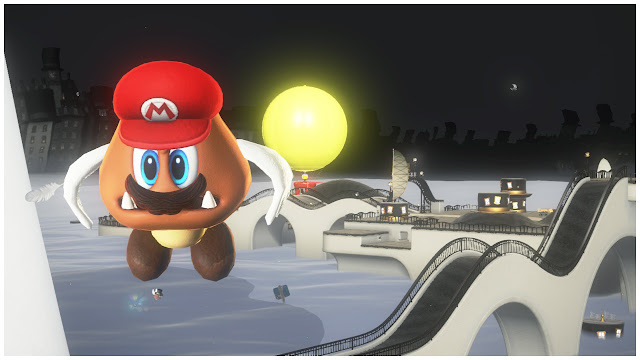 The really enjoyable and entertaining Power Moons come from diverse platforming challenges as well as solving puzzles, entering secret challenge rooms that test one ability (whether one of Mario's or that of a capture ability) in reward for a Power Moon (and a second if you're exploring well enough), and mini-games like jump rope, RC racing, beach volleyball, as well as racing with Koopa Troopas and adorable denizens of the Snow Kingdom. One challenge might have Mario crossing a breakable bridges of blocks that gets increasingly more perilous as Bullet Bills barrage and blast into it, while another might take Cappy away from Mario for an athletic obstacle course over a bottomless pit, featuring rotating and spinning platforms. Then, there are sections of Super Mario Odyssey where you'll enter purely 2D sections with 8-bit mural art. You'll be going at it like old school Super Mario Bros. but on a 3D surface like a tower as seen in the Sand Kingdom. As seen displayed on the tower in the background, a 2D platforming challenge for Mario. 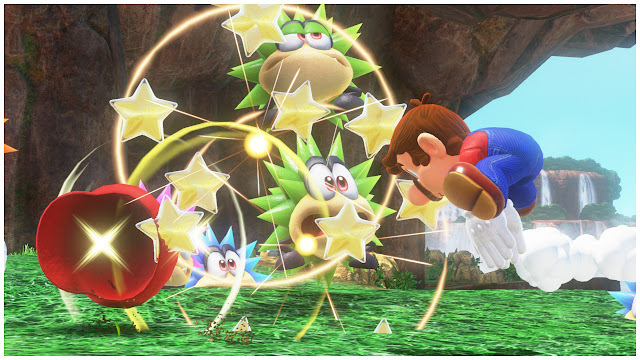 However, many times Power Star challenges can be as simple as ground pounding a specific spot, chasing and catching a cowardly rabbit, having a playful pup dig up your desired treasure, dressing in the right outfit to acquire access to an otherwise locked area, finding Captain Toad, seeing a Power Moon on a platform and just picking up, looking into a viewfinder, and so forth. A fair amount seem like undercooked ideas that were just placed as padding to up the count of total Power Moons in Super Mario Odyssey. When I started getting to post-game, I already learned most of the "basic" Power Moon types in kingdoms, just like chasing and catching a cowardly rabbit, having a playful pup dig up my desired treasure, looking into a viewfinder, and so forth. Thankfully, the truly creative Power Moon challenges do come at a varied amount and are much more interesting. Heck, even these simple Power Moon objectives can build up your count quite easily, and perhaps that was Nintendo EPD's intention to allow younger or less skilled players access to Odyssey's ending. This purple goop certainly isn't grape juice either, Mario. By the time you reach the ending of the game, save the princess, and view the credits, you might have a sizable amount of Power Moons under your belt, but you can easily beat Super Mario Odyssey doing the bare minimum and collecting only a handful of Power Moons from various kingdoms. Doing this, though, is a huge disservice to the game. This isn't your typical 3D Mario with just 120 total collectibles. There's a seriously large tally of Power Moons to get. Post-game unlocks include new kingdoms and new Power Moons in already visited kingdoms. More Power Moons unlock new outfits for Mario to purchase at the various Crazy Cap clothing stores in each kingdom. Speaking of which, Super Mario Odyssey isn't just a globe-trotting platforming adventure but a celebration of Mario's history. This is best displayed within the game's Crazy Cap brand of stores, one in most kingdoms. You can mix and match hats and outfits that Mario can proudly display throughout his journeys all across the world, as well as buy souvenirs with kingdom-exclusive purple coins. Whether it's an American flag-inspired golf suit from NES Open Tournament Golf, Mario's artist outfit a la Mario Paint, a red and yellow construction suit as seen in the Wii U's Super Mario Maker, or other surprises from past Mario entries both mainline and not, the amount of clothing and options is astounding and remarkably wild. What better way to go on an odyssey than with an explorer's outfit on? How do you cook your Mario? Al dente? Let's actually talk about the kingdoms. They are boosting and exuding with creativity and personality. Every kingdom you start at is set up in a particular way. Once the threat of Bowser has been removed from it, the kingdom greatly expands, and places where there may have been obstructions are now gone. Each kingdom has a different theme spelled out in its name: Cascade, Sand, Wooded, Metro, etc. These kingdoms also have unique citizens that behave and appear differently from citizens of other kingdoms, like the Day of the Dead rhythm-loving creatures of the Sand Kingdom or the highly mathematical robot gardeners of the Wooden Kingdom. Even the in-game brochures of the various kingdoms within Odyssey go in to detail on these locales. Rather than just a map of the kingdom (which is highly helpful in locating Power Moon locations and transporting between fast travel points), but detailed information about sights to see, things to do, backgrounds on the people and culture, and points of interest, too. 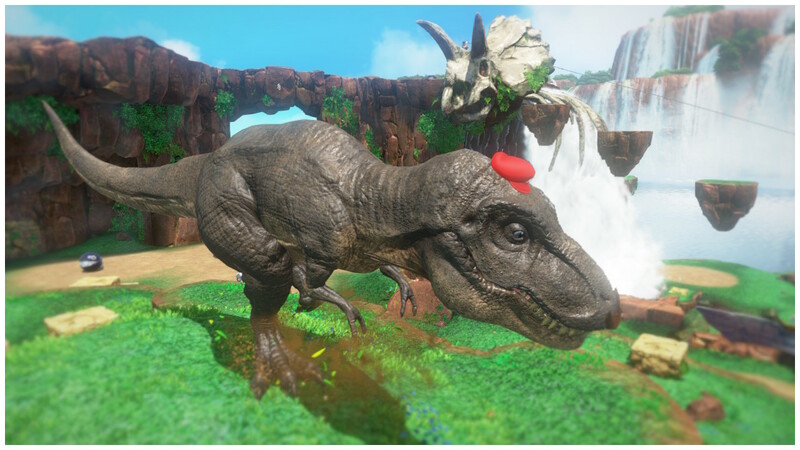 From the fresh mountain air and serene waterfalls of the Cascade Kingdom (where you can also use Cappy to capture a giant dang T-Rex to do exhilarating damage!) 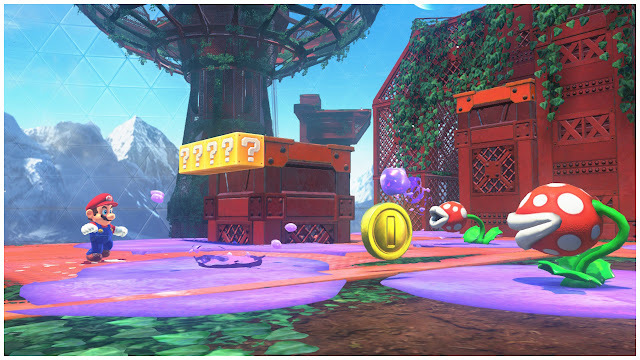 and the platforming playground in both Mario's ground game as well as vertical game with the Metro Kingdom, to the simple polygonal fruits and vegetables and pink lava flowing through the Luncheon Kingdom and the blissful beach and glorious sunset of the Seaside Kingdom, Super Mario Odyssey's different kingdoms are packed with platforming challenges, fiendish puzzles, hidden secrets, unpredictable scenarios, and wondrous views. Don't even get me started on the tremendous quality that is Odyssey's version of Bowser's Castle! Sure, it's not Jurassic Park, but I argue it's better -- it's Mario as a T-Rex! By far my favorite kingdom in Super Mario Odyssey has to be one I mentioned before, the Metro Kingdom, and that is where New Donk City is located. This metropolis perched on top of an enormous skyscraper is home to some smooth citizens, all wearing suits and caps, as they go about their business. Mario saves the day in his initial visit here, where the sky was dark, the weather was rain with a definite chance for storms, and a gigantic mechanical Wiggler wreaked havoc throughout the city thanks to Bowser's work. After the mechanized monstrosity is defeated, the skies turn blue and the denizens go about their business. Now, the place is all opened up, allowing for Mario and Cappy full privilege and pleasure to go hog wild, riding on scooters, vaulting off signposts and taxi cabs, wall jumping in alleyways up to rooftops, heading to the tallest building in town -- city hall -- and leaping from top all the way for the gut-wrenching ride down to street level. With Mecha-Wiggler defeated, a full festival gets underway, and it's one of my most cherished moments in recent gaming history. I won't spoil why, but it's worth playing for any Mario fan. Super Mario Odyssey doesn't disappoint in its attention to detail, level design, or amount of content, and I'm glad to report that it doesn't disappoint in its presentation either. I played the full game on my TV, as I thought the latest 3D Mario deserved nothing less but a big screen appearance and play-through, but in both docked and undocked forms, Super Mario Odyssey runs rock solidly. The details in the environments are stunning to look at, though close up textures like grass can look a bit off. Though I admit the photo mode certainly helped picked things like that up for me. 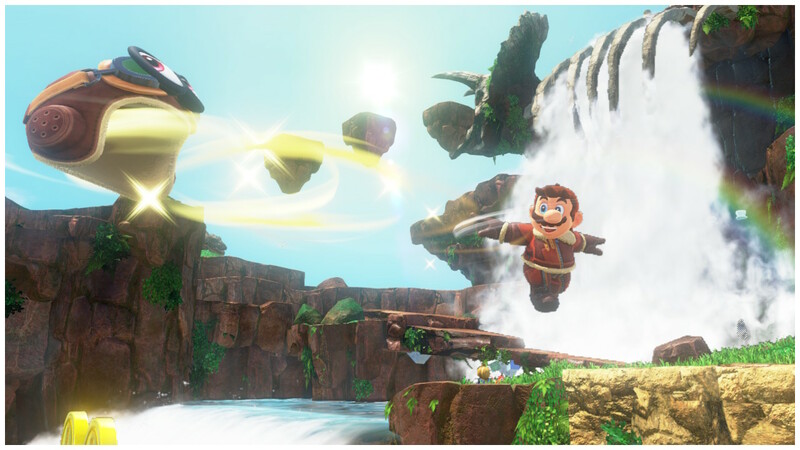 Visual special effects like the glimmer of the Seaside Kingdom's sunset between a rock archway or Mario being all shiny as he exits a body of water are some of just a myriad of amazing things I noticed while playing the game. There's so much more, and definitely a lot more lovely touches. Musically, Super Mario Odyssey's soundtrack is superb. It has a mix of musical styles, much like the mix of locales featured in the various kingdoms in the game. 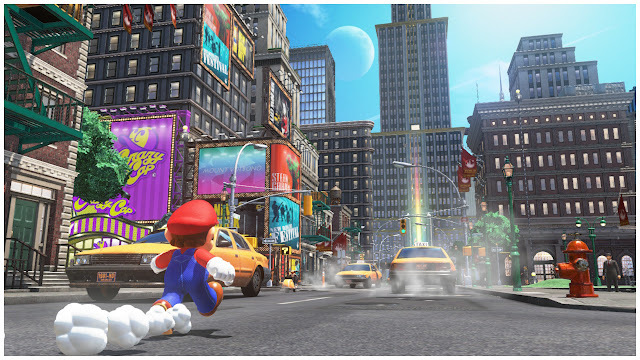 Instead of being a unified "orchestral" sound like the Galaxy games or something that is mostly "big band" like Super Mario 3D World, Super Mario Odyssey's music runs the gamut and a quite striking and great one at that. 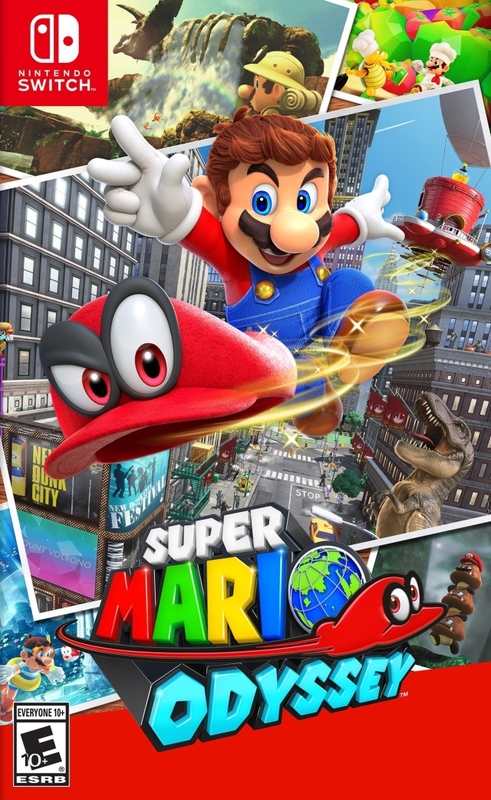 Super Mario Odyssey is a masterful game, but after all the insipid and seemingly throwaway Power Moon challenges in the game (that thankfully don't make up the majority of the game's content), the forced recommendations by Nintendo in both menus and gameplay to use motion controls, and a generally low difficulty make it a game that isn't my favorite 3D Mario. It's a superb new structure to 3D Mario, however, offering a massive playground with specific story-tied missions and a whole slew of challenges to find and complete outside of finishing one and then getting kicked out of the entire level. Super Mario Odyssey isn't a revolution to 3D Mario like Breath of the Wild was to 3D Zelda, but at the same time, it doesn't have to be. As I said, Nintendo has reinvented 3D Mario time and time again. They've done it before, they've done it partway here, and I hope for the long term they'll do it again. For now, I'd love to see Nintendo take what worked from Odyssey and perhaps make a sequel with some more fleshed out ideas and any concepts that were left out of the game since there's SO much potential. Regardless, Super Mario Odyssey is one of the best games of 2017, so once again, Nintendo (specifically Nintendo EPD), my hat's off to you.